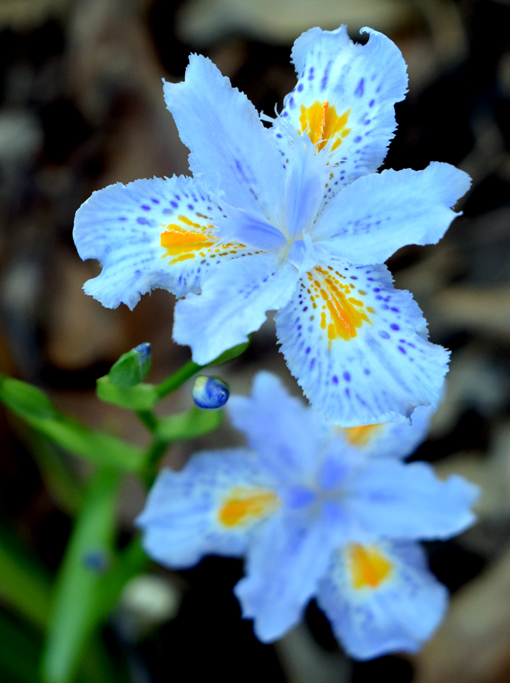 Now is a perfect time to visit the Atlanta Botanical Garden, specifically for its annual Atlanta Blooms! exhibition. 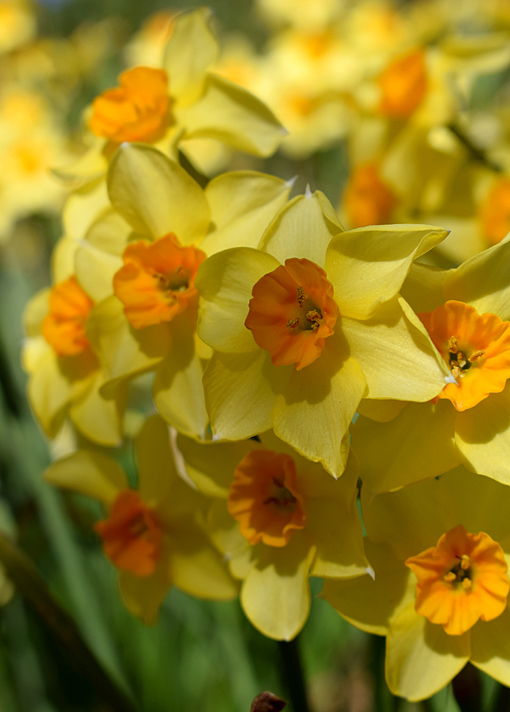 Although we had an extremely mild winter—seems last week was our "whole" winter—the Atlanta Botanical Garden is filled with thousands and thousands of daffodils, tulips and countless other blooms! Right now! The photos in this post were made just yesterday, March 19, the last day of winter. Hard to believe, but true story! I think this is greatly in part due to a story my mother told me as a child. As it goes, we were visiting my grandmother and little Travis, barely old enough to walk, comes into the house bearing a single stemmed blossom, saying, "Flower, Mommy, flower!" 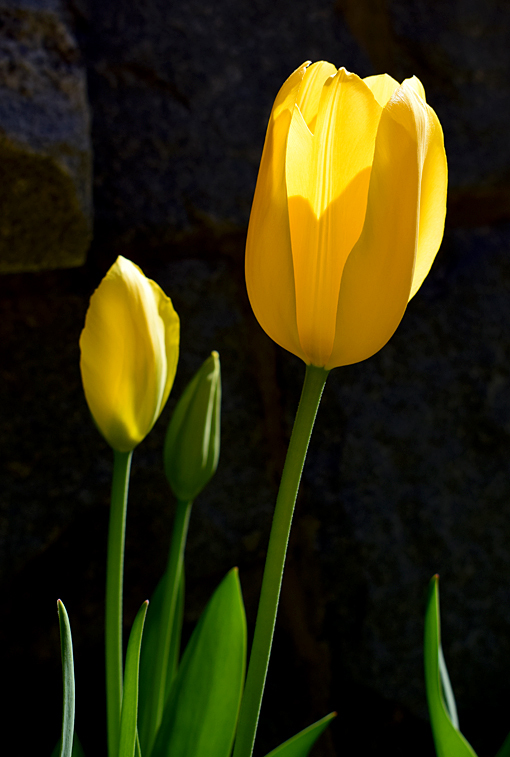 That flower was the only surviving tulip in grandmother's garden following a harsh freeze. And I picked it. Sweet and innocent, I was. 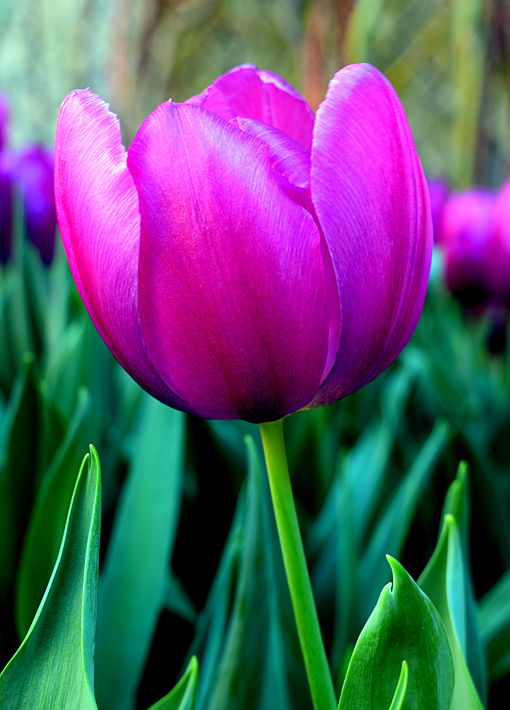 I've loved tulips all my life because of that story. I miss my grandmother Evelyn dearly. If you've not been to the Garden in the last few or couple of weeks, get there soon so you can see the "field" of tulips surrounding the "Water Mirror", accented by the Dale Chihuly Saffron Tower, the sculpture we got to keep after last summer's Chihuly in the Garden exhibition. They're spectacular! I was afraid that last week's freezing temperatures would have wiped out all the new blooms, but Garden staff either took great measure to protect them or planted extremely hardy varieties. I'm grateful either way. 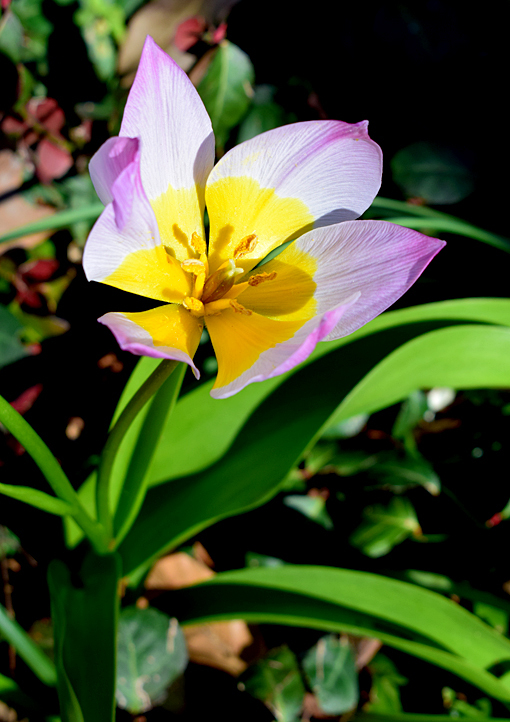 I know that the Garden plants tulips (at least a great many) that will thrive even though mild winters. 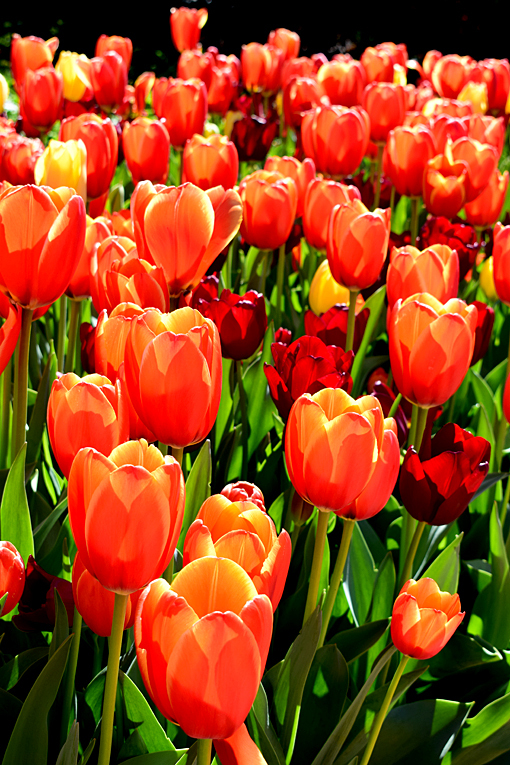 A lot of tulips, as I understand it, require a number of days of below-freezing temperatures to—in the spring—reach their full potential height. 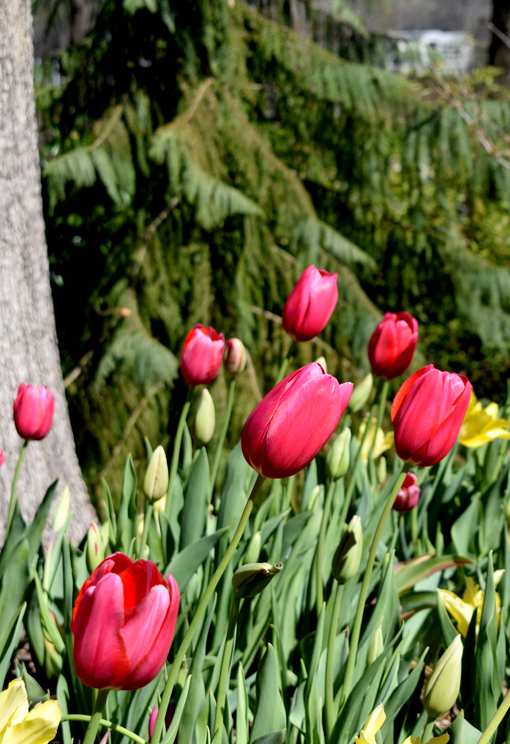 But tulips and everything else pictured here are thriving, despite the recent freezing temperatures! I read in National Geographic Magazine—known for its magnificent photography—many, many years ago that the optimum times for photos are sunrise and sunset. I "listened" to that and do my best to take advantage of that wonderful lighting. I get super excited when I see the results of such lighting. If only it weren't so fleeting. The photo above is one that had the sunlight behind it. I encourage you to get creative and not assume that "back lighting" is a bad thing. With digital cameras—the freedom to make hundreds of photos in a single outing, if not more—there's ample opportunity to explore and discover what works and what doesn't. Make all the "tiptoe through the tulips" jokes you want (there's a lot more history to this song than most know)...the bottom line is that Atlanta Blooms! is one of the most magnificent flower displays in all of Atlanta! Please, do make time to see it. This display has encouraged many Atlantans to plant more spring bulbs in their own gardens. The Atlanta Botanical Garden has been a wonderful influence on beautifying out city! I encourage you to get "up close and personal" with the flowers in this exhibition, while respecting the Garden, of course. It's not respectful or polite, to the Garden or other Garden visitors, to trample into flower beds to get the "perfect" shot. It's not enjoyable for others when beds are disrupted and plants damaged for the sake of a picture. Enjoy the Garden, but please leave it intact for others to enjoy. I'm just sayin'. While I like to play with light, there's the occasional shot with full-on sunshine that makes for a decent photo. If you're a budding photographer, I encourage you to experiment—and to read, read, read up on tips and best practices for optimal photographs. Just imagine how amazing your photos will be if you build on what others have already learned and then let loose your imagination on top of that! 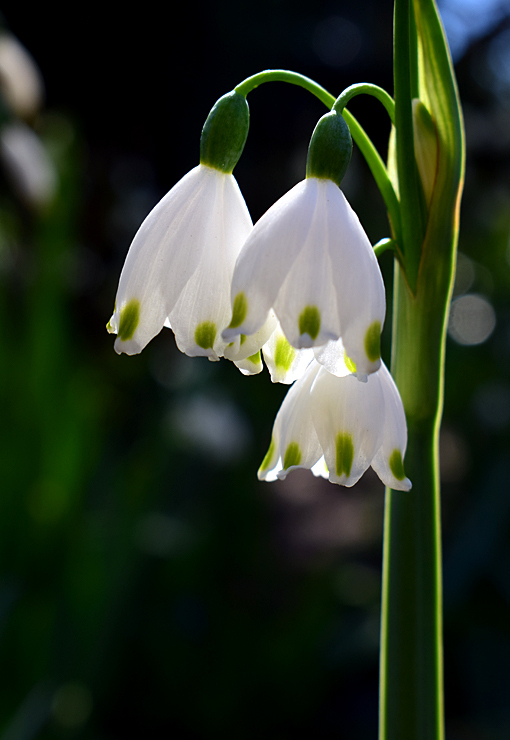 This particular flower fascinates me! To me, it looks like a praying mantis with Phoenix wings! You see it, don't you? 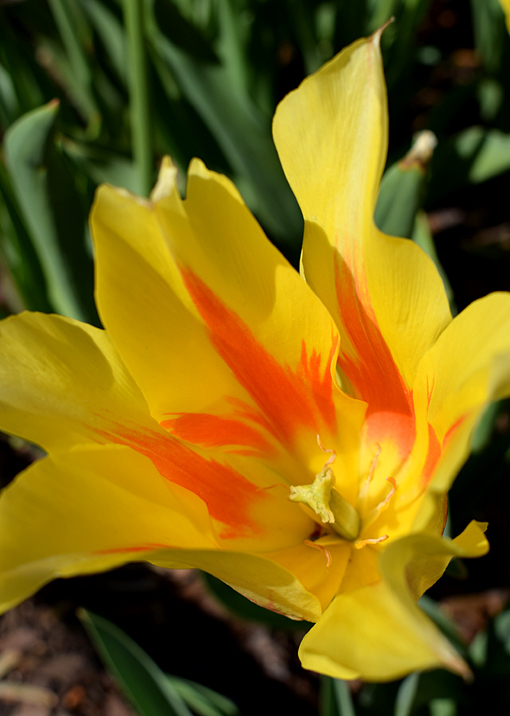 And it's a tulip! Have you seen Santa Mantis during "Garden Lights, Holiday Nights"? 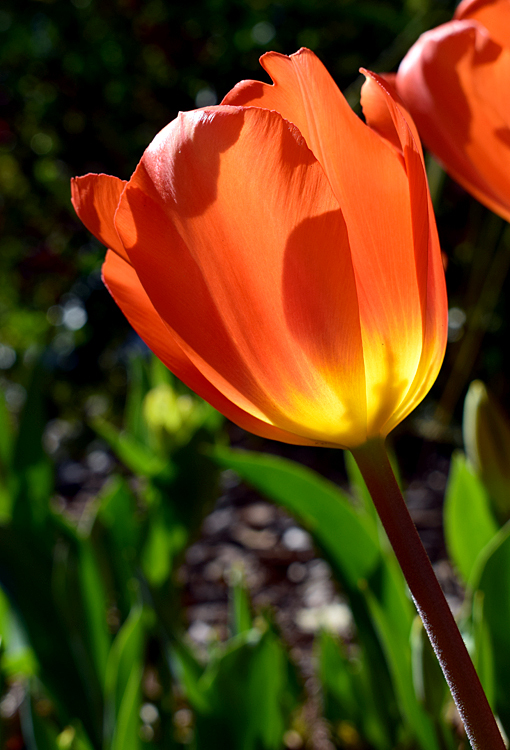 Get to the Garden soon so you can enjoy Atlanta Blooms! and if you visit by April 9, you'll also get to enjoy this year's spectacular Orchid Daze! When planning your visit, be sure to check the Garden's website for other programs on or around you planned visit. There's always something "blooming" at the Garden!